Noah The Best Coming of Age Story EVER! Do you remember the first kiss or the first time you were ever attracted to someone? It's time for you to get out the memory data. This is the book for you! PHOENIX, ARIZONA, UNITED STATES OF AMERICA, January 23, 2019 /EINPresswire.com/ -- Noah True Love Never Dies is being vehemently praised by readers. No book on the market remembers love the way Carol Denise Mitchell writes about it via Tiffany, the main character! 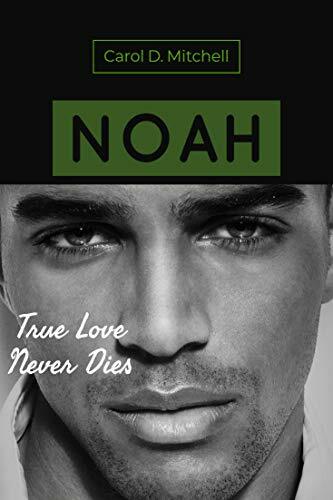 Lauded for her keen ability to bring characters to life, what makes Noah True Love Never Dies so captivating is the writer's incredible ability to write out of the box. There is no status quo for an author who has a story to tell. Tiffany Mitchell is invisible inside a family where she is one of sixteen children. Outside of the home from kindergarten to senior high school, she seeks attention by falling in fantastical love with boys who seemingly don't notice she's there. It's a hard life when in an assembly, the narrator asks virgins at Blake High School to stand up. Tiffany views herself as a loser when she is one of the only girls to attest that she does not have a boyfriend, "nobody wants me," she announces. This coming of age story will have you howling over the first kiss. How responsible is a drama teacher when she leaves hormone popping teens in the back of an old station wagon, while she leaves the car to gather materials for a school play. Tiffany travels an interesting road to find love. From elementary school to high school and onward, she experiences setbacks that many of us can truly identify with. And then, one night before she marries Piper, there he is. Noah becomes the true love of Tiffany's life. At last she sees love, feels love, and knows instantly, that Noah Crawford, a handsome bartender will undoubtedly be the uncontested love of her life. Mitchell is a storyteller that uses her personal experience upon which to build her novels. I suppose the story would fit into Urban Fiction...but it is more a biography of a woman searching for love, including in the wrong places. It reads very much like a diary that she has kept since grade school and the content matures along with her as she becomes older. It is intimate, revealing and yet a story that fills you with the possibilities... With a totally satisfactory ending! Teens through adults will enjoy Tiffany and Noah's story... Check it out! It is an American love story that craftily weaves a young girl journeys in loves as she becomes a woman. The humorous, provocative, and biting reality of how women experience and express love fill the pages. In several places it caused me to reflect on the relationships I have had in the past. It was truly sobering. Have fun and enjoy the emotional roller coaster Tiffany goes through to discover what love is all about. Reading this book was like reading a juicy diary. The characters each leave a lasting impression.